Hello everyone! 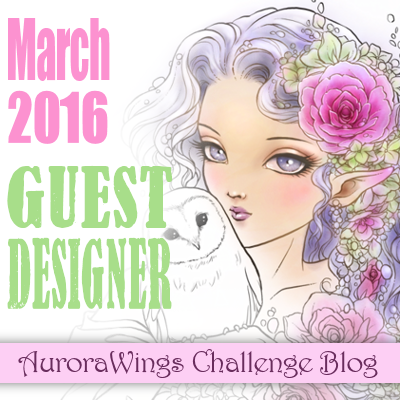 We are back with a new year and new challenges at Aurora Wings! To start the year off we have an Anything Goes Challenge. I have a lot of January birthdays in my family and friends circle, so I coloured up Cupcake Sprite for a pretty in pink birthday card. 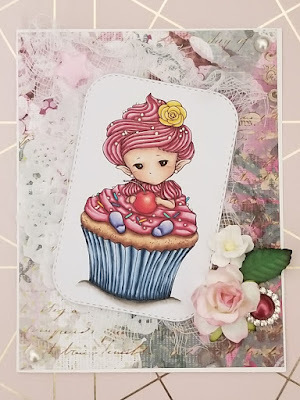 I used Copics to colour my image, along with some silver glitter gel pen for the nonpareils on her frosting. I also used a paper doily, some cheesecloth, flowers and other embellies when I put it all together. 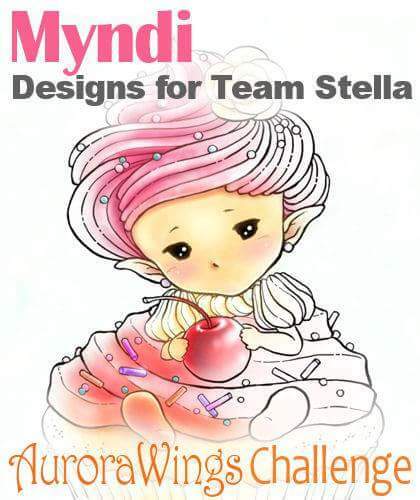 Pop over to the challenge blog, if you haven't been already, and check out the work by my team mates. There are some beautiful creations over there for you to be inspired by. Scroll all the way to the end for links to the Cupcake Sprite image in the AW store and on Etsy, whichever you prefer to shop at.